Beginner's guide to the outdoors from a fellow beginner. Staying hydrated is one of the most important ways to make sure you enjoy yourself outdoors, no matter what season it is. Hiking is 100 times more enjoyable when you have water…and you actually remember to drink it. I can’t even count how many times just drinking some water has taken care of feeling like crap when hiking. This is particularly important somewhere dry like Colorado, if you’re hiking at higher altitude, or if you’re hungover (or, god forbid, all three). Don’t let cold weather fool you into thinking you don’t need to bring water with you. It’s extra dry already, and your body uses up a lot of water to heat up the freezing cold air that you breathe in all winter long, making hydration a year-round priority. Bringing water with you isn’t exactly rocket science, but buying a reusable bottle or using a reservoir will be more cost-effective in the long run, cuts down on plastic waste, and allows you to bring much more water with you. REI has a million options, and if the amount of options on that webpage overwhelms you, don’t worry, you’re not alone. The orange bottle on the right is a Nalgene. This is a common style, but I also commonly spill water all over myself when I drink out of them. The basic Nalgene-style bottles are typically the cheapest, but I usually end up spilling water all over my face because of the wide opening. Fortunately, Nalgene makes a narrow-mouth model. 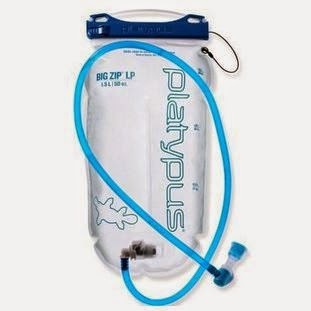 Camelbak used to make a model with a straw (blue bottle in the center in the above photo). If you’ve decided to like hiking enough that you want to go for a few hours or several miles, you can also consider getting a bladder (also known as a reservoir, but I think bladder sounds funny). These are awesome because you don’t have to reach back into your backpack thanks to the handy dandy straw. You can bring more water with you as well, and it doesn’t take up much extra room in your pack. I compared multiple models of reservoirs in this blog. If you’re going to be sweating a lot, consider adding an electrolyte to your water. I love Vitalyte because it is predominately made up of sodium instead of sugar. The taste is discrete and the product is overall very cost-effective. I had some issues with fainting a while ago, and still have what some might call a delicate system, and Vitalyte has become my drink of choice to keep any light-headedness at bay. I’ve also tried Clif Shots, but they are much more expensive and the flavor is way more noticeable. I’ll stick with my bag o’ Vitalyte in the meantime. If you prefer sports drinks, at least try Gatorade Zero, since it has less sugar. I have nothing against Powerade, except for I threw up right after drinking it once and the blue flavor came up black. It was necessary to share that disgusting story with you to explain why I will never drink Powerade again. I could be biased, but getting your wisdom teeth taken out is traumatic enough without that experience added on. Now that you’ve got that image in your head, get out there and recreate safely! Staying hydrated is key to enjoying yourself outside, so don’t skimp on the water and have fun out there. Previous Post You missed the point of this blog. Get new blog posts straight to your inbox.